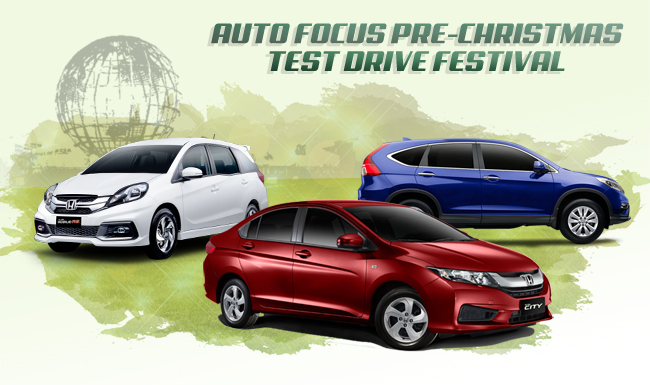 Honda Cars Philippines, Inc. (HCPI), Honda’s automobile business unit in the Philippines joins the annual Auto Focus Pre-Christmas Test Drive Festival in the SM Mall of Asia Concert Grounds from November 12-15, 2015. The grand test drive event is a unique experience for all prospective buyers and motoring aficionados. This event will allow customers to experience Honda’s advantage through test drives and to avail its latest vehicle offerings. In this event, Honda’s newly introduced New City 1.5 E CVT Special Edition in Ruby Red Pearl Color will already be available for test drive. The New City 1.5 E CVT is equipped with new features, such as UV cut glass windows for the front windows, an Auto Door Lock system, a key fob with Panic Button, and also comes with a free Sharp Plasmacluster with Ion Technology. All components are specifically geared to enhance The City’s style, and the occupant’s health and wellness, safety, and convenience. Honda curates an automobile exhibit like no other with models like the City, Mobilio, CR-V, Odyssey, Accord, HR-V, Brio and Brio Amaze with Modulo accessories. These vehicles will all be available for test drive on a specially designed track. The wide array of models will satisfy the diverse tastes and preferences of everyone who joins the festival. Honda booth visitors can also avail of the Low Cash-Out and All-in Bundle deals for vehicles like the City 1.5 VX Navi CVT for as low as Php 66k, the CR-V 2.0 V 2WD MT for Php 90k, the mobilio 1.5 V CVT for Php 81k from bank partners after the event. Furthermore, all customers who will test drive any Honda vehicle instantly receives a special token. The 4-day test drive festival headed by Sunshine Television’s Butch Gamboa is open from 9:00 am to 10:00 pm and admission is free.